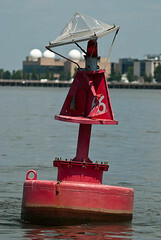 The National Oceanic and Atmospheric Administration (NOAA) deployed a “smart” buoy just south of the Wilson Bridge on Friday, May 4. The new device will provide scientists and local area boaters/educators with real-time information about the Chesapeake Bay. The buoy is part of the the CBIBS (Chesapeake Bay Interpretative Buoy System) program and will collect weather, oceanographic and water-quality observations along the Captain John Smith Chesapeake National Historic Trail. The program hopes to not only provide relevant data for restoration efforts, but also provide insights about the waterways’ history and encourage stewardship and protection of the Chesapeake Bay. All of the eight buoys’ measurements, along with historical information, can be accessed at www.buoybay.org (www.buoybay.org/m for mobile devices) and by phone at 877-BUOY-BAY (877-286-9229).